This radial-tracking deck combined ease of operation with superb performance specifications. It featured a new, advanced type of tone arm carrying the remarkable MMC5 pick-up with its unframed, elliptical diamond stylus. The platter was of a lightweight design (400 grams) to reduce torque at starting. Its carefully milled profile, with large metal surfaces set between slim bands of Nextell, ensured high electrical capacitance between the record and the metal, effectively earthing static charges without actual contact. It was driven by a flat rubber belt from a tacho-controlled DC motor. The belt's compliance acted as a mechanical filter, preventing motor vibrations from reaching the record and stylus. To complement this improved arm/cartridge combination Beogram 1800 had a new faster-acting movement control system with separate cam wheels for vertical and horizontal arm movement, so that automatic operation gave you music within a very few seconds. So cueing was really fast, but still careful of your records. 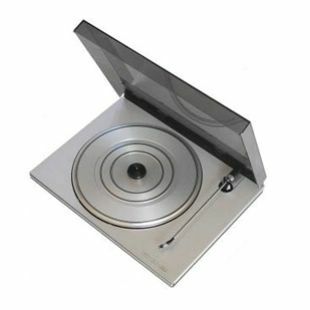 For improved record safety, you could operate normal PLAY and STOP functions while the lid was closed. Just one touch - the rest was automatic. Record size and speed was identified by the Beogram's logic circuits. Beogram 1800's slim plinth had a brushed aluminium finish. Opening the lid gave access to three further function controls: CUE, 33 and 45 speed overrides (for non-standard discs). Beogram 1800 was designed by Jacob Jensen and at the 1969 Hanover Fair Bang & Olufsen and Jacob Jensen were presented with the iF award for no less than 4 products for 'outstanding industrial design' including Beogram 1800. These are probably the slimmest looking record player available. Quite a bit of this is down to clever visual tricks and surprisingly, the decks related to this model all looked thicker. It sold well and may were bought to work with non B&O systems. It shared the excellent suspension of its predecessors and had the new cartridge mounting. Now available for little money, this is a superb sounding deck. Highly recommended. Beoworld says: very slim looking deck with similar performance to 1700 but with new cartridge range. Possibly takes light weight just that bit too far. Faster automatic mechanism seems a little jerkier than before. Very good value though.